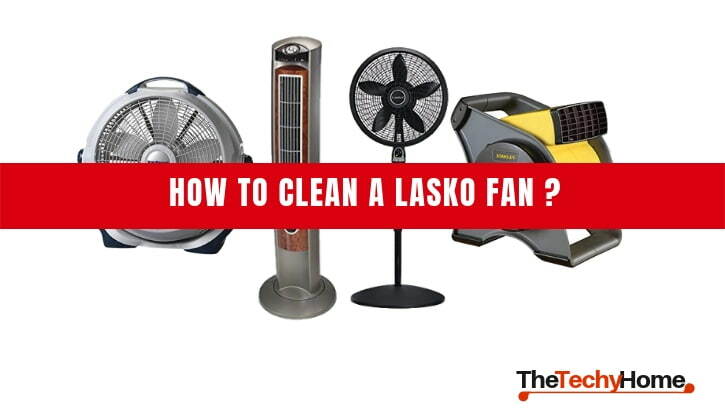 What are the typical Lasko Fans? regularly in order to make sure the full functioning of the device. Generally, this type may be a single or twin-sized fan. It provides various different characteristics and is quite in use. For cleaning it you will need to take the fan of the window. Then put it on the floor. You will have to use a screwdriver to take the screws around the perimeter. After that, apply the kitchen towel to clean big pieces of dust. Then clean blades and panel with the soapy water. Let them dry on the air. Finally, put the blades together and position on the window. This type of fans is multipurpose. It comes with an adjustable height and head that makes it an important device for the living room, bedroom or kitchen. In order to clean a pedestal fan, firstly you have to disassemble both grills, the front and rear one, for ensuring meticulous cleaning. Then you have to clean the blade after taking them apart. It can be done by reversing the directions of the set. Fill a big bowl with soaped drip the blade inside it gentling wiping with the soft cloth. Then apply soft damp cloth for wiping other parts of the fan. Use clean water to take away the soap from the details and let them dry on the open air. All fans’ units were created to provide a high-velocity airflow in a compact package. By using the brush attachment on a hoover is one of the most effective ways to clean the tower fan. Actually, tower fans consist of the space-conservation and ionic blowers. Additionally, Lasko Tower fans provide some benefits. They eliminate allergens, pet dander, and dust from the air. The cleaning of the fans are the same and it requires a soft-haired brush of the vacuum cleaner for taking away the dirt from the grill areas, but you should know as well. Here are some steps to follow for a successful cleaning. The first thing is to attach the brush to the vacuum cleaner. Clean the intake grill of the fan in order to get rid of dust gathered. Do not open the housing of the fan. Apply a soft cloth to wash the out fan housing. Additionally, you can use vinegar or some alcohol for cleaning. The Lasko Cyclone fan was created for using in a single room. This fan consists of an automatic shut-off timer and various panels. It is available for buying in many homes retail stores and online as well. For cleaning the Lasko Cyclone fan you need to turn off the power supply and put it on the flat surface. By applying the screwdriver, you should remove the screws. Then clean all the details with a damp cloth without touching the motor. Then restore the screws to assemble the fan. In order to clean this type of fan, you will need to place it face down on a flat surface and remove the screws from the back side. It is important to remove the securing knobs too. Then put apart the grill covers to get to the blades. Take a cloth and clean the blades from the dirt. The usage of soapy water is necessary since it may take away all debris. Remember not to touch the motor. After wiping all the parts, assemble the fan together. There are many different types of brushes for cleaning the fans, so you may not for sure what is the best. However, we will provide the most popular ones. The first type of brushes is flexible brushes. You can put them on the vacuum cleaner and work along the grills. The soft tips of the brush will gently scrub the dust. Also, you can use them for cleaning motor, just be sure that the brush is dry. Another tool is a duster. The surface of the duster is made from dense chenille microfiber. It enables to use of the sides of the duster. Microfiber helps to clean the fan without using any chemicals. Nevertheless, all the above-mentioned tools are useful for a domestic cleaning. If you have serious problems with the fan, you can ask the specialists to help. They have special devices together with chemicals which will enable thorough cleaning. If you want to clean the fan, you should be aware of its structure and type. After reading the proposed tips, you can easily clean your fan. Remember, that the cleaner the fan is the fresher the air you will get. Do not forget to clean the fan on a regular basis.